Chaplains of Ternopil-Zboriv Archeparchy of UGCC were in the East of Ukraine, where they visited Ukrainian military, who serve in ATO zone. The priests delivered donation to soldiers from faithful of the Archeparchy, benefactors and Ternopil Charitable Foundation “Caritas”: foodstuffs, medicaments, warm clothes and personal hygiene products. “For our cordial battalion “Ternopil” we have bought petrol-powered saw, because here it is as cold as at home (soldiers prepare themselves to winter). Items, which give the most warmth to them, are our sincere prayer and love, which they feel , when we visit them, serve for them and deliver goods donated by the faithful – simple and sincere Ukrainians”, - said fr. Volodymyr Toporovskyi, military chaplain. While visiting military, chaplains offered prayer and Sacraments, tried to provide everyone with pastoral care. “It happened that we were not able to reach part [of people] due to unforeseen circumstances” – shares fr. Volodymyr Toporovskyi – “I believe that they [circumstances] will change and we will jointly offer a prayer, because it saves us and helps all. Our men need it here very much. We jointly pray for them in our parishes and in our families”. 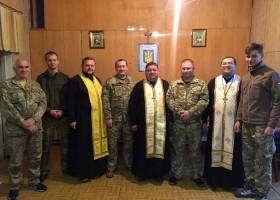 This trip of military chaplains of Ternopil-Zboriv Archeparchy happened with the blessing and financial support of Archbishop and Metropolitan of Ternopil-Zboriv Vasyl (Semeniuk). Military were sincerely grateful for the memory about them and great benevolence of people and clergy.